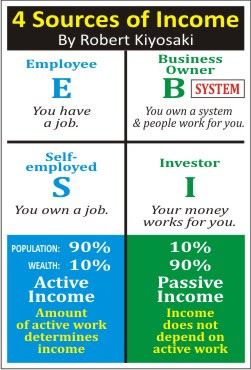 Another IBO Site: How do you make money right now? How do you make money right now? Most people earn income as a direct result of their activities through Employment & Self-employment (i.e. doctors, lawyers & small business owners). In fact, the largest percentage of the population belongs to these categories. Only a small portion of the population enjoys the seemingly unlimited payoffs of Investing and Business ownership with a system. The difference is in how people understand how money works. The truly rich people know that, to be financially successful, we really don’t need to exchange time for money. Earning money through active work poses more risks because when time comes that we aren’t able to work for any reason, income may also stop. Truly, there are better ways to achieve financial success. We can show you a way where you can move from the left to the right side through Business Ownership with a System. Eventually, you may also want to become an investor. We know people who have time but no money and people who have money but no time. Is there a way to have both time and money? YES! Be an Independent Business Owner today! Follow our 2-5 Year Business Plan following The System to have both money and time, working 2-3 hours a day or 10-20 hours per week only. Phase II: in 2-5 years, you can earn 2 Million plus in passive potential income per year with free travels. You don't need to quit your job or abandon your current business to create passive income. We have a highly effective Team Approach Strategy, formulated by highly experienced & successful Independent Business Owners around the world, that are tested & proven over the years to provide predictable results to help you achieve financial success. It is not guaranteed that the information, techniques and/or approaches in this website will work for you. We hope however that the ideas presented herein will assist you in developing a strong and profittable business.